Pocket Wallpaper - Create themes and wallpaper for PocketPC and other mobile devices. Create themes and wallpaper for PocketPC and other mobile devices. 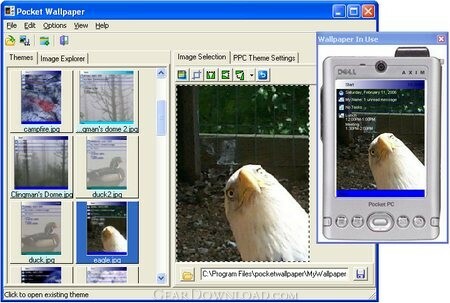 Using this studio you can crop and resize any image to fit on your PocketPC or other mobile device. For your WindowsCE devices you can create themes for your Today screen. Adjust colors for items displayed on the Today screen. Set your image to be transparent, even select the color you want to use for the transparency effect. Drop down menu even appears transparent. Uploads directly to any selected folder on your smartphone or PocketPC. This download (pocketwallpaper.exe) was tested thoroughly and was found 100% clean. Click "Report Spyware" link on the top if you found this software contains any form of malware, including but not limited to: spyware, viruses, trojans and backdoors. Life Poster Maker 3.7 - Create posters from your digital photos! Show off your vacation pics in style! ImageElements Photo Suite 1.81 - Enhance your digital photos with cool effects. Bring out the best in your pics. ImageElements Picture Framer 1.2 - Put your photos in a virtual picture frame for print or web use. ImageElements Motivational Poster Maker 1.3 - Create your own motivational or demotivational poster. Use any picture you want. ImageElements Photomontage 1.9 - Create a montage style effect from a single picture. Use a variety of styles. ImageElements Photo Captioner 1.1 - Add cool captions and effects to any photo. Outlined, angled, gradient and more! ImageElements Photo Cropper 1.5 - Crop a photo into multiple frames. Great for triple frame effect! ImageElements Filter Utility 1.5 - Quickly apply various effects to your photos! ImageElements Photo Collage 1.3 - Create free-form posters and collages from your photos. Many styles and options!